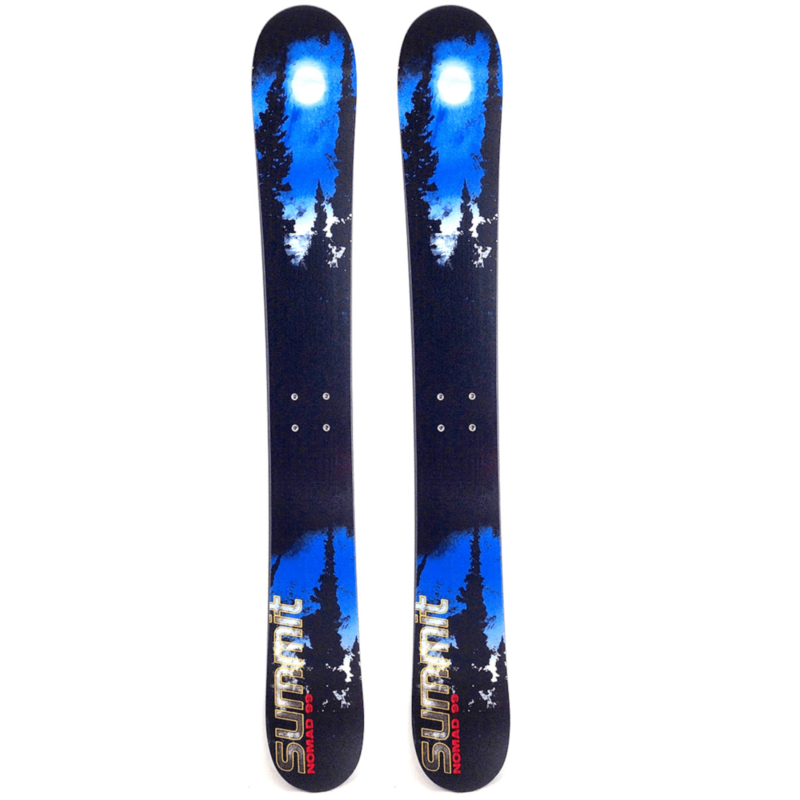 Summit Nomad 99cm LE Skiboards with Atomic L10 Release Bindings with high gloss top sheet. “The Nomad 99 is made for fast turns, varying conditions and speed. 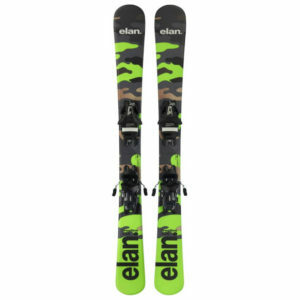 It is a great all around skiboard for intermediate to advanced riders. Yes - Include a Free Sticker! These symmetrical twin tip skiboards are constructed specifically for high performance riding with stability at speeds you won’t believe. Made for all mountain riding, the wide body shape is equally at home on the groomed runs as well as in the crud or floating in powder. Summit skiboards are designed with one goal in mind – to take the sport of skiboarding to a new level of performance. Be prepared to push the limits of what you thought was possible on skiboards. The new Nomad meets our goal. These are brand new. Limited edition. These are on the Outlet because they have a High Gloss top sheet which can scratch easily if not treated carefully. Make sure they don’t hit together when riding as edges are sharp. So we are offering these at a lower price than our Ecstatic 99cm skiboards. 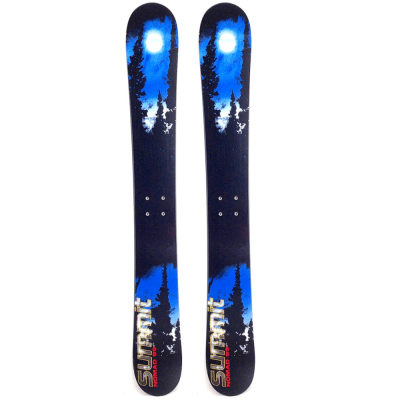 If you are hard on your skiboards then get the Ecstatic or Carbon Pro 99c skiboards instead of these. Handcrafted, one pair at a time, with extreme attention to detail, this season’s Summit Nomad 99cm LE Skiboards with Atomic L10 Release Bindings is constructed with a vertically laminated tip-to-tail wood core. The parabolic sidecut is constructed to function impeccably with the solid birch wood core to deliver almost effortless carves. These are made to hold an edge no matter how hard you charge it. The consistent tip to tail flex brings a new level of carving to skiboards, whether in glove dragging lay it over carves or ripping the moguls. Smooth, rock solid performance and incredible stability at speed, a result of the quality inner materials and the ABS sidewall construction, provide a ride like no other 99 cm skiboards on the market. The Summit Nomad 99cm LE Skiboards with Atomic L10 Release Bindings are designed for true all mountain riding, these handcrafted skiboards will take you into those breath taking steep chutes or flying through the glades in total control. The wide body platform delivers great floatation in the deep stuff, offering awesome performance for something this size. You can lean hard on the back tails and they are going to support you, a true comfort to know during those deep powder days. Edges hold even on ice. Symmetrical twin tips make it easy to ride forwards and backwards or just spin down the mountain. No matter what you choose to take on, the new Summit Nomad skiboards are simply made to push the envelope of what you thought was possible on skiboards. Recommended for advanced to expert riders and for intermediate riders who are ready to take a quantum leap in their ability level. Bindings: We pre-mount the release bindings for you and include free wide brakes. 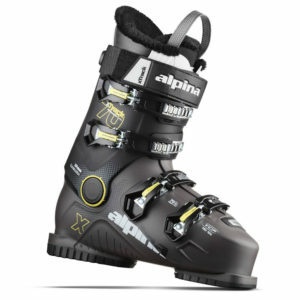 Step-in Release: The Atomic L10 bindings are our choice for adjustable, step-in release bindings this season. These come with free mounting and free wide brake. These fit ski boots size approx. 4-14 US. Snowboard Bindings: We recommend the Technine Custom Pro DS Snowboard Bindings with Summit Riser kit for high performance with snowboard boots. These were designed by us to work perfectly with skiboards, while allowing you the comfort of using snowboard boots on your skiboards. For 5 years running now, these have a proven track record of skiboard performance with snowboard boots. The Custom Snowboard bindings feature 3 padded rachet straps to hold you in place when carving. This allows a more stable interface between boots and bindings. Includes two Quick Leashes by Five-Forty ($9.90 value) and Summit Snowboard Binding Riser Kit. Fits snowboard boot sizes 7-14 US. Note: While there are currently no specific guidelines or laws preventing the use of non-release bindings on skiboards even up to 135cm, the longer length skiboards when used with non-release bindings do increase the risk of injury. Should you choose to use non-release bindings you do so at your own risk knowing full well that there is the chance of serious injury. Read more about various Skiboard Binding Options. Sidewall Construction: The high energy, lively wood core is sandwiched between two top layers of triaxial fiberglass, a layer of Kevlar and a bottom layer of triaxial fiberglass providing just the right combination of flex and torsional stiffness that offers an incredibly smooth ride. In addition, an extra layer of biaxial fiberglass is added to maintain the smooth tip-to-tail flex allowing just the right carving feel. A layer of rubber dampening makes for vibration absorption while still allowing for maximum “road feel”. With sidewall construction, the Nomad provides many advantages over cap construction. Among these advantages are increased torsional stability, greater edge protection, enhanced power transfer to the edges, additional vibration dampening, greater strength and reinforce the full length flex from tip to tail. Wood core: vertically laminated birch wood core runs the full length of the skiboards, tip to tail, providing a highly responsive energy as well as greater long term durability. The wood is Northern Hemisphere birch which is very light, yet super strong. Colder temperatures create wood that is denser, thus super strong, while being very light in weight. This is why we choose wood from the Northern Hemisphere. This wood allows for a smooth flex throughout the length of the skiboards. 360 full wrap Rockwell carbon steel edges: protects your skiboards from those unexpected dings while providing superior edge grip. Symmetrical Twin-tips: makes it easier to ride forwards as well as backwards (fakie). Excellent handling in the parks and pipes. Also, makes for the most perfect carves. Sintered bases: this is one of the best base materials for durability, maximum wax absorption and speed. These p-tex 4000 bases have less friction and thus more speed as well as less vulnerability to abrasion and impacts. The Black sintered bases are much easier to repair dings or gouges and bring them back to original looking condition. Polyurethane High Gloss Top Sheet: protects the silk screen graphics and top layer. Additional UV protection added. Sidewall Bevel: further protects the top sheet from those occasional nicks. Custom fit aluminum reinforcement mounting layer: This layer provides maximum retention no matter what bindings you prefer to use (ours or yours while not inhibiting flex. Base bevel: 1 degree and side bevel of 89 degrees – great for carving with ease. These aggressive edges are great for ice, and lay it over carving.